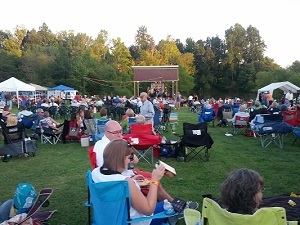 Relax and see excellent music at a great, casual, award-winning fun outdoor concert venue overlooking Lake Cabernet in Northeast Guilford County. Just as Grove Winery is passionate about bringing you the best in local flavor, our Wine & Song concert series brings you the best in local and regional sound. Tickets are available for all Wine & Song shows at the door for $10 or $15. Advanced, discounted tickets are available here online at least up to a week before each show. Online purchasers just need to give their name or order number at Will Call. You should bring a chair or a blanket if you don't have a reserved table. A limited number of advanced reserved tables are available for each show. A reserved table includes admission for four. Reserved tables for five or more people are available by buying a reserved Table for 4 plus one or more additional tickets under the same name in advance. The entire party will be seated together. Season passes are available for individual admission and tables. Passes are good for all Wine & Song concerts listed here. Season passes are transferable to other people if you cannot use your ticket for that show. Doors open at 6 pm. Food is available for each show. We can, of course, supply Grove wine and local craft beer. By order of NC A.L.E., please do not bring alcohol that was not purchased on Grove premises. Fine Print: Parking is free. This is an outdoor show, so dress/prepare accordingly. Shows are generally held rain or shine. Drummers & accordion players are moody so schedule subject to change. Check this website and the Grove Winery Facebook page for updates. Bring the whole family. Parking, kids under 10 and dogs on a leash are free.